In its first-ever University Impact Rankings, the Times Higher Education measured the social and economic impact of over 500 universities from 75 countries related to their work on the SDGs. Out of the universities measured, Waterloo ranked fifth in climate action, ninth in sustainable cities and communities, 11th in partnerships for the goals, and shared the 13th spot overall. 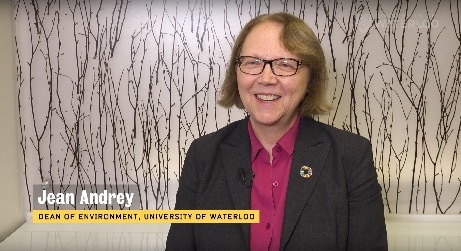 The University of Waterloo is home to Canada’s largest environment faculty and, in partnership with the Waterloo Global Science Initiative, is the founding institution of Canada’s Sustainable Development Solutions Network (SDSN). Click on image to watch interview. The SDSN’s mandate is to catalyze and convene Canada’s post-secondary institutions to foster practical solutions and joint learning opportunities toward the achievement of the SDGs. Since launching in May 2018, SDSN Canada has undertaken a number of initiatives, including the development of an SDG Cities Index for Canada, engagement with students across the country on how to implement the SDGs on their campus, and the development of a database on Canadian researchers working towards the SDGs. Moving forward, SDSN Canada plans to convene an annual national SDG gathering across academic, business, government, and civil society, and to further develop educational curriculum to teach students the skills needed to implement the SDGs in their career. The Times Higher Education released their 2019 University Impact Rankings today.